Over time, the Big Bang – unquestionable icon of the art of fusion, created to shake up existing codes – has proven its ability to introduce exclusive designs. The Big Bang Sugar Skull Fluo, the new neon trend icon, is adorned with fluorescent accents. It offers four luminous guipure lace iterations to adorn the wrist. Striking and confidently glamorous, they dress the finest St Gallen embroidery in bright, bold colours. Cobalt Blue, Sunflower, Hot Pink and Malachite Green are the four shades chosen to enlighten and refresh. For spring 2017, the Big Bang Broderie Sugar Skull Fluo is once again revisiting traditional materials in an original, modern way – this time with Bischoff embroidery from St Gallen. This ancestral craft has travelled across the globe and is entrenched within the world of fashion. In order to take the Art of Fusion to its very pinnacle and assert its desire to move embroidery away from its traditional applications and challenge its identity, Hublot naturally turned to the magician of Swiss embroidery: Bischoff. With its cutting-edge innovation, performance and creativity, internationally renowned Swiss brand Bischoff is a key industry figure. 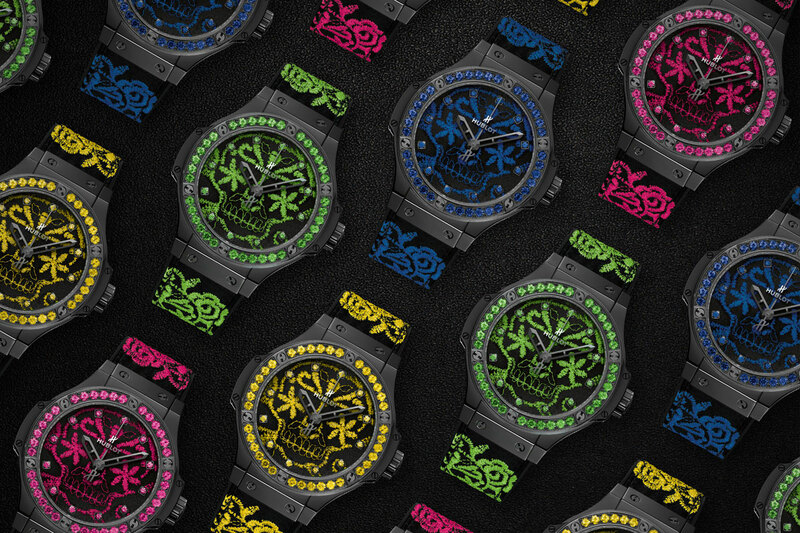 In its workshops in St Gallen, near Zurich, Bischoff’s master artisans created specially commissioned fluorescent embroidery on silk organza delicately embroidered with floral arabesque motifs and subtly revealing the ‘skull’ design that will adorn the dial. This eye-catching fluorescent lace contrasts against the black ceramic, adding depth to the watch’s original design. Its 41 mm case reveals ‘skull’ motif embroidery in electric shades, enhanced by 12 coloured gemstones – blue, yellow, or pink sapphires or tsavorites – and a strap embroidered with a bright applique. Four colours released as a total of 100 pieces. Chase away grey skies and brighten up your day with the Big Bang Sugar Skull Fluo: the must-have accessory for timepieces collectors to spice up your day and inject some new energy.